The study, ‘Modernizing the Mix: Transforming Marketing Through Technology and Analytics’ explores the growing importance of marketing technology management. The study was conducted in May 2016 by market research firms MORAR and Withpr in collaboration with DataXu. 532 marketers across the U.S, Germany, the UK, Spain, France and Italy were interviewed to create an extensive quantitative research study. The primary goal of the study was to determine the impact that technology plays in the operations of marketing teams internationally. Martech is understood as the marketing tools, which allow a business to target known customer segments. These include CRM platforms, marketing automation solutions, social media management and e-commerce technologies. So how is martech changing the way businesses work globally? Specifically, understanding marketing technology is a critically important skill-set needed for marketers. This surpasses the need for marketers to have data literacy (58%) and even understanding digital media (59%). The graph below shows just how important understanding martech is to modern marketers around the world. Martech is so important that 70% of marketing teams have a dedicated team member. Often this person manages the marketing technology stack for the entire company. 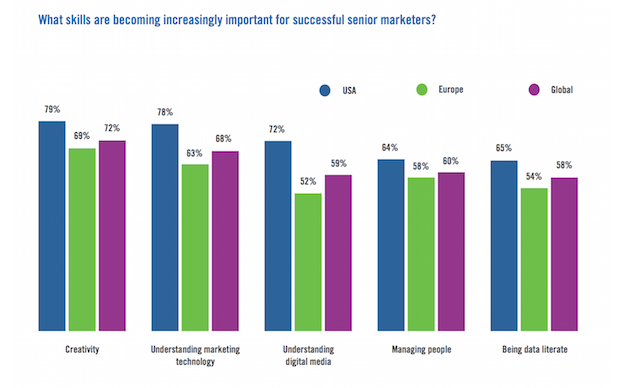 Globally, 70% of marketing teams have a person dedicated to marketing technology, and in Europe, 66% of marketing teams have a person dedicated to this role. 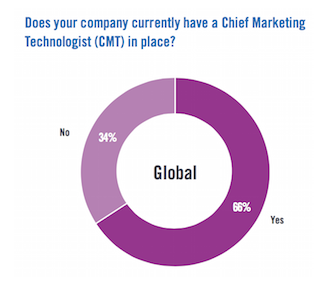 In fact, 66% of companies have a Chief Marketing Technologist (CMT) to manage martech directly. 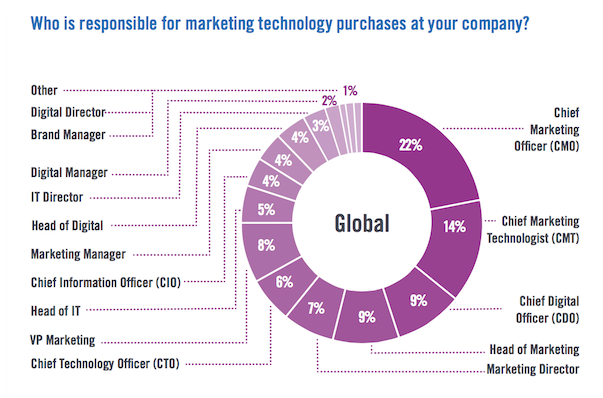 As shown in the graph below, marketing professionals are often the ones responsible for purchasing and managing the martech solutions. With the exception of a few IT positions, including the Chief Information Officer (4%), IT Director (3%), Head of IT (5%) and Chief Technology Officer (6%). However, there is a growing need for marketing and IT departments to work more collaboratively within a business. According to an article published in the Harvard Business Review, it is the Chief Marketing Technologist’s role to align, “marketing technology with business goals, serving as a liaison to IT, and evaluating technology providers”. Furthermore, in 2012, the research firm Gartner predicted by 2017 a business’ Chief Marketing Officer would spend more time with technology than the Chief Information Officer would. Furthermore, the report asserted that the number-one marketing challenge for modern marketers is understanding how to create an effective marketing mix across channels. 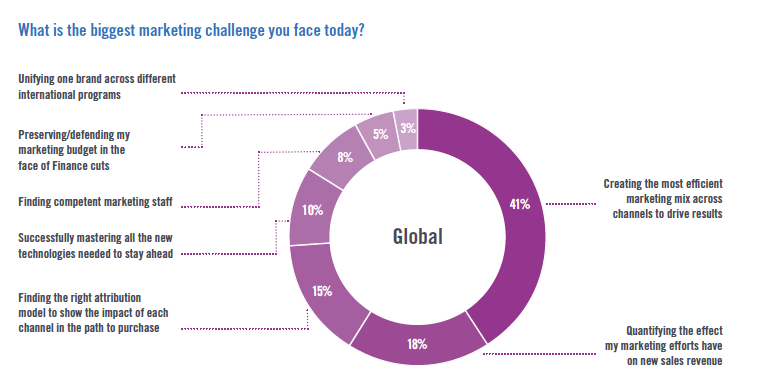 41% of global marketers included in the survey believe the single biggest marketing challenge facing their organisation is creating the most efficient marketing mix possible across channels to drive results. Marketers often use a variety of martech solutions rather than one full-stack solution. However, as a result, they acknowledge that their time becomes too thinly divided across too many platforms. 23% of global marketers surveyed identify “being stretched too thin due to working with and managing too many vendors” as the largest current threat to their team’s success. An enterprise solution built with the Liquid State Platform, allows businesses to share the latest marketing content directly to their audience’s devices. Not to mention, creating multi-channel content, building apps, segmented delivery, actionable analytics and third-party integrations. To find out more read our solutions guide below.